Welcome to the second instalment of our Community spotlight for Warhammer: Vermintide 2 – an opportunity to feature the genius creations and creators from our community. The Blight Stormer - bulbous and vile. Cédric claims his Fatshark socks this week with this submission to community@fatshark.se. We love this fan art! More please, Cédric! "Thanks for your amazing job with Vermintide 2! Seriously. That's the best gore and fun experience I ever had. Cheers, and excellent job to everyone!" "This is a custom statue I had made. It’s my personalized Kerillian, from the bow and hood that I used to the trinkets I have equipped around her waist. Makes it infinitely more valuable to me. Thank you for your time and the wonderful game that you all worked so hard on." 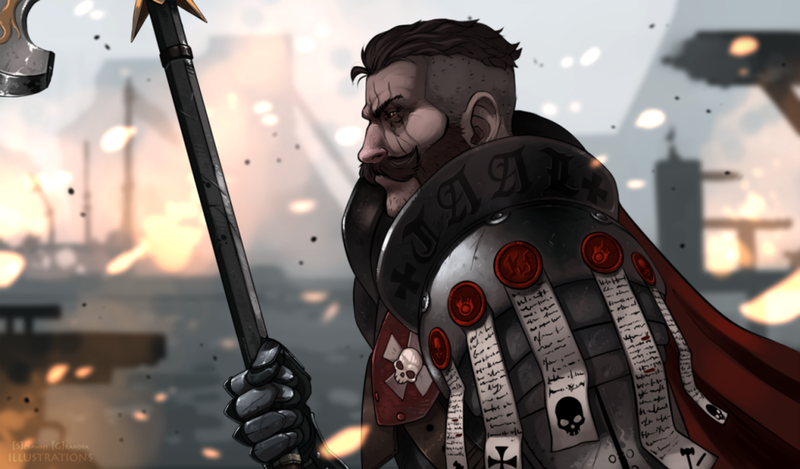 Kruber and Saltzpyre feature in another double edition of fan art finds. We’d link to the artists’ page directly but some might make you blush, so we’ll credit by name alone! It may be untitled, but it’s certainly worthy of featuring in the fan art finds this week! Tank life eh, Bardin? No doubt you checked our Grimoire guide last week, here’s a visualisation for one of the trickier ones! IshkaTV has been playing a whole lot of Vermintide over the years and this week hopes to get his final legend maps complete – that is, when he’s not in the midst of moving from Europe back to his homeland in the USA. Be sure to chuck him a follow to get notified when he’s next back online and smacking rats! A comprehensive guide to Vermintide 2 features this week. All you need to know about almost everything! Bonus: It’s funny as heck. Thanks for reading and remember to send your creations and feedback to us at community@fatshark.se and we might feature it!